Left: A bottle of Angostura Aromatic Bitters. A bitters derives it name from the fact that is does not contain added sugar or sweetener. If the bitters is a drink additive, it therefore does not change the sweetness level of the drink. If the bitters is a tonic it may have some sugar added, although EU legislation dictates the definition of a bitter is that it does not have sugar added. Angostura bitters was first compounded in Venezuela in 1824 by a German physician, Dr. Johann Gottlieb Benjamin Siegert, as a cure for sea sickness and stomach maladies. Dr. Siegert subsequently formed the House of Angostura, a company selling the bitters to sailors. It was exported to England and to Trinidad, where it came to be used in a number of cocktails, following its medicinal use by the Royal Navy in Pink Gin. 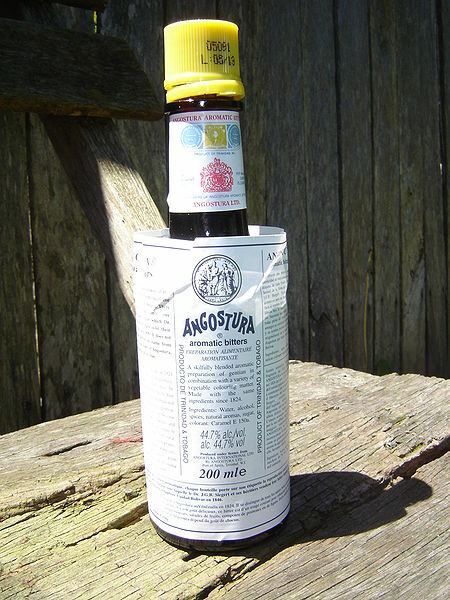 Angostura and similar gentian bitters can be of some value for settling a mild case of nausea. It is used to stimulate the appetite, either for food or for cocktails.